Boeing and Airbus delivered 87 and 69 commercial jets in September 2018, respectively, compared to 78 and 55 deliveries during the same month last year. September is traditionally a busy month for deliveries. Boeing has made a strong comeback after the company only delivered 39 aircraft in July as a result of 737 delays due to late deliveries of fuselages and engines from suppliers. 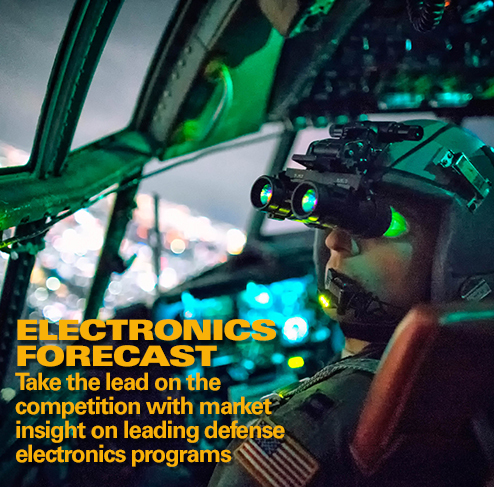 Boeing has stated that it is making good progress toward fixing the logjam by year end and has also reaffirmed its full-year delivery target. In 2017, Boeing delivered 763 jets (748 in 2016), in line with company expectations, while Airbus surpassed its delivery target of 700 jets by handing over 718 aircraft during 2017 (688 in 2016). In September 2018, Boeing delivered 61 737s (of which 22 were 737 MAXs), well above the current monthly rate of 52 jets. The company also delivered one 747, one 767, six 777s, and an impressive 18 787s. Boeing raised its 737 production rate to 47 per month in Q3 2017 from 42 previously, and recently increased it further to 52. Boeing plans a further increase to 57 737s per month in 2019. 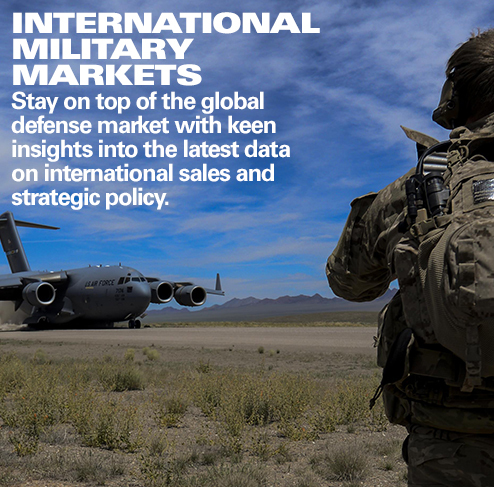 When asked about the potential for a 2020 production hike, Boeing’s CEO Dennis Muilenburg stated in September 2018 that the market can support a production rate higher than 57 per month. Boeing delivered 568 aircraft in the first nine months of the year and is 14 jets ahead of last year’s delivery figures (was five ahead in August). 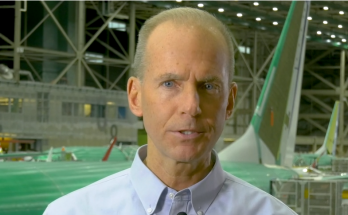 A resolution to Boeing’s ongoing engine and fuselage supply chain issues is of vital importance while the company transitions to the 737 MAX while ramping up the production rate. The 737 MAX is powered by LEAP-1B engines built by CFM International, a joint venture between France’s Safran and General Electric. Boeing 737 fuselages are supplied by Wichita, Kansas-based Spirit AeroSystems, which makes about 70 percent of the structure. Spirit AeroSystems has faced disruptions this year in its own supply chain due to soaring demand. 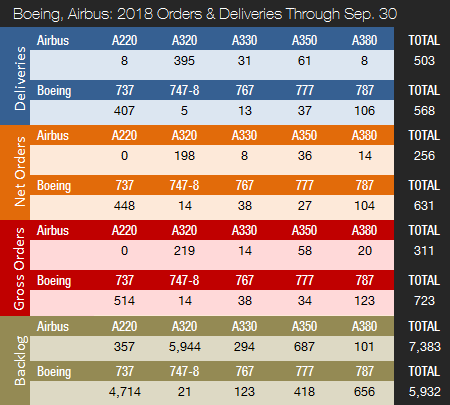 In September 2018, Airbus delivered three A220s, 51 A320s (14 ceo / 37 neo), four A330s, and 10 A350s. Airbus has delivered 503 aircraft this year to date and is 49 jets ahead of last year’s delivery figures (was 35 ahead in August). Airbus has done an impressive job of catching up after the company was trailing its 2017 deliveries by three jets in June and as many as 19 jets in May. Airbus’ long-lasting struggle with late deliveries of engines from Pratt & Whitney and CFM International for the A320neo family of aircraft appears to have been resolved for now. A total of 181 A320neo family aircraft were delivered in 2017 vs. Airbus’ forecast of 200, up from 68 in 2016. By mid-2019, Airbus expects to be delivering 60 A320 jets per month. The company has internally been debating rates beyond 60. Airbus delivered 78 A350s in 2017 and has increased the monthly production rate to 10 this year. Airbus is considering a further increase up to 13 A350s per month in 2019. The ramp-up of A350 XWB deliveries combined with a higher A320 production rate means that the company is narrowing Boeing’s deliveries lead and could surpass its top rival by 2019 or 2020. With 50 net new orders in September, Boeing had a satisfactory month in the orders race. In September 2018, Boeing logged 65 gross orders (minus 15 cancellations => net of 50). The company booked three orders for a total of 32 737 MAX narrowbodies, including 22 for two undisclosed customers and 10 737 MAX 8 aircraft for Air Peace, a Nigerian airline. Additionally, Boeing landed an order for 18 KC-46 tankers for the U.S. Air Force (767-2C) and four orders for a total of 15 787 Dreamliners. 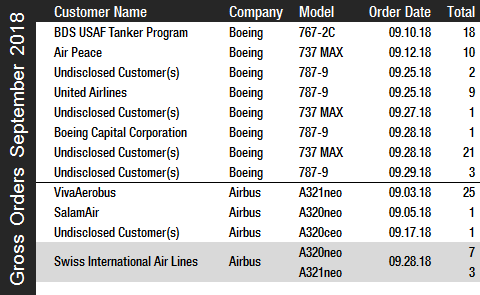 These orders included nine 787-9s for United Airlines and one 787-9 for Boeing’s leasing and lending arm, Boeing Capital Corporation, with the remaining orders placed by undisclosed customers. Following a very disappointing order haul in August, Airbus’ September bookings improved to 37 net new orders (no cancellations => net of 37). The highlight was Mexican low-cost airline VivaAerobus’ order for 25 A321neos. Also, on 28 September, Swiss International Air Lines ordered seven A320neos and three A321neos. Despite being well behind Boeing in this year’s orders race, Airbus has retained an orders lead over its rival every year since 2012. In 2017, just as Boeing looked set to win the orders race, Airbus finished the year on a very high note and reported a full year intake of 1,109 net new orders ahead of Boeing’s 912. 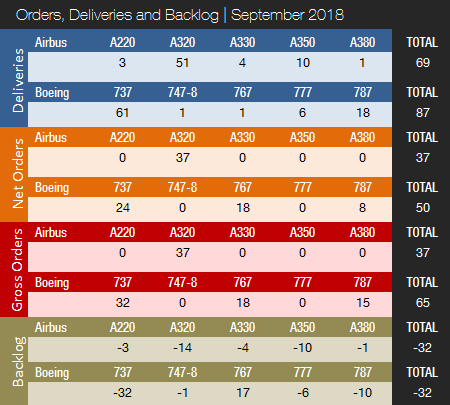 Airbus’ order backlog as of September 30, 2018 stands at 7,383 jets (of which 6,301 or 85%, are A220 and A320ceo/neo family narrowbodies), ahead of Boeing’s backlog of 5,932 aircraft (of which 4,714, or 79%, are 737 NG/MAX narrowbody jets). 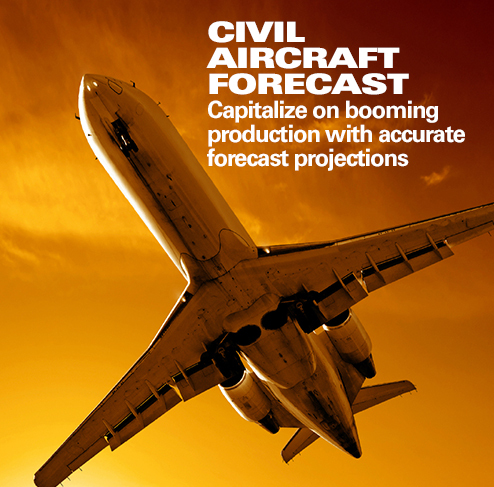 Last month, Boeing set a new all-time backlog high with 5,964 aircraft. Airbus’ backlog record was set in July (7,464 unfilled orders), thanks to the addition of the A220, formerly known as the Bombardier CSeries. The number of Airbus aircraft to be built and delivered represents a 10-year backlog at the 2017 production level. 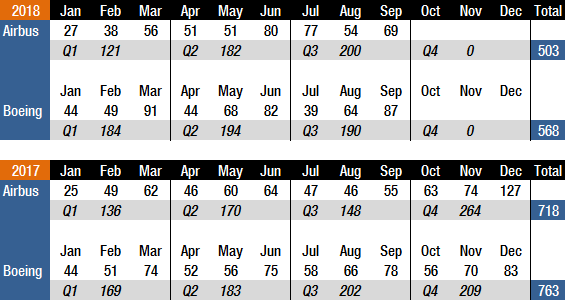 In comparison, Boeing’s backlog would “only” last 7.8 years. Airbus booked 1,109 net new orders in 2017, resulting in a book-to-bill ratio of 1.54. Boeing booked 912 net new orders in 2017, for a book-to-bill ratio of 1.20. In 2018 to date, Boeing boasts a book-to-bill ratio of 1.11 (1.21 in August), with Airbus at 0.51 (0.50 in August). Next Article It’s a Mess Up There!